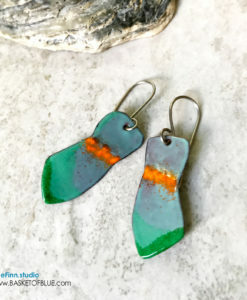 Painterly enameled copper earrings with a green glass bead dangle. 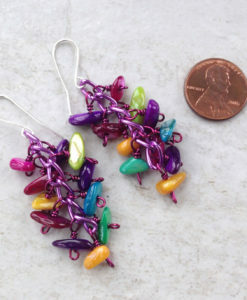 Picasso style enamel earrings, many colors mixed together for a fun effect. 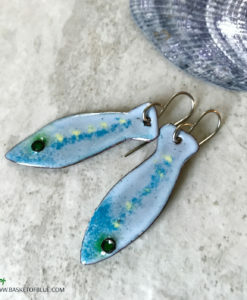 These were torch fired with vitreous glass enamel and while heated the swirls were created by mixing with a rod on colorful enamel whiskers. Every pair is unique! 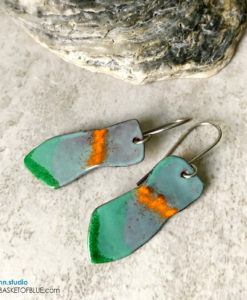 Painterly enameled copper earrings with a green glass bead dangle. 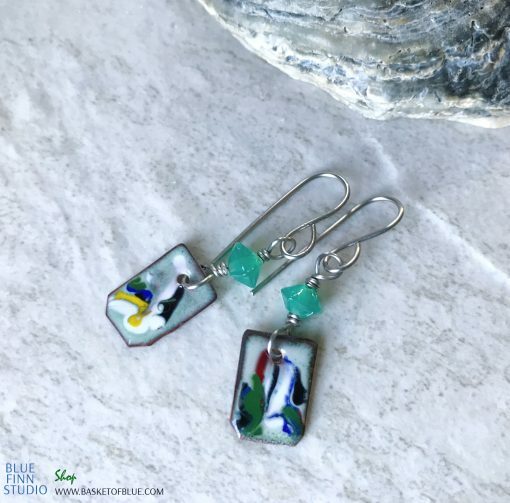 Picasso style enamel earrings, many colors mixed together for a fun artistic effect. 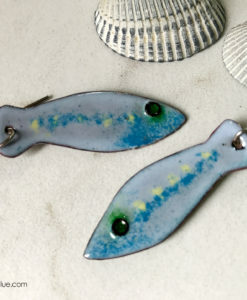 These were torch fired with vitreous glass enamel and while heated the swirls were created by mixing with a rod on colorful enamel whiskers. 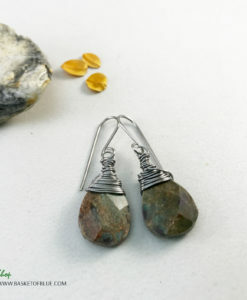 Totally unique pair! 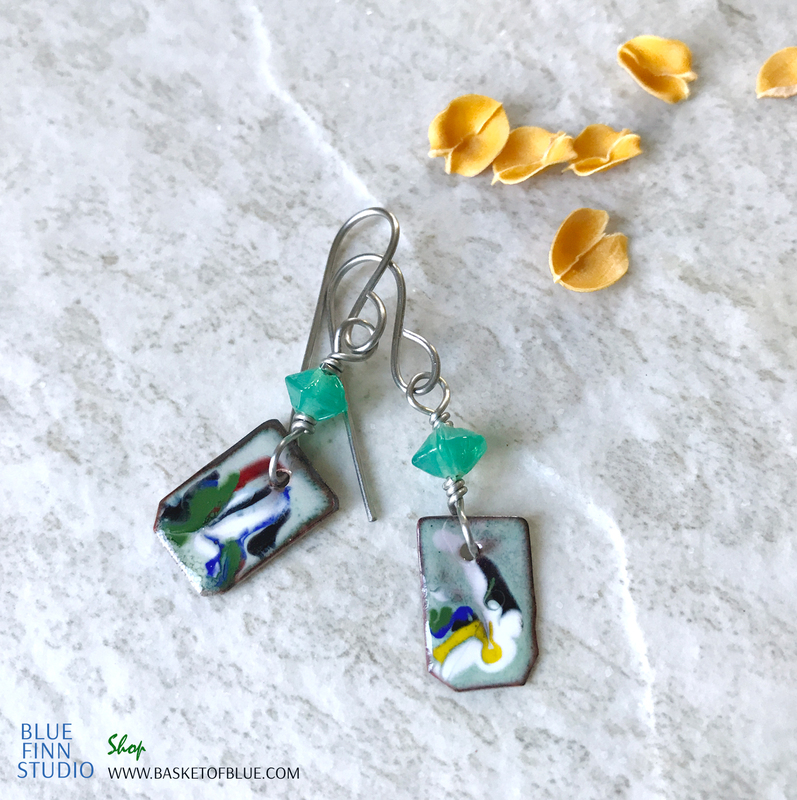 Enameling is glass fused to metal at high heat. 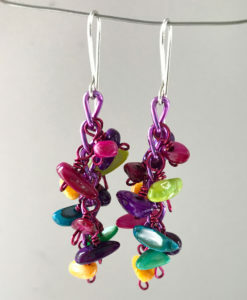 Enamels are finely ground glass, like fine sand (or even more finely pulverized and mixed with an oil or adhesive). 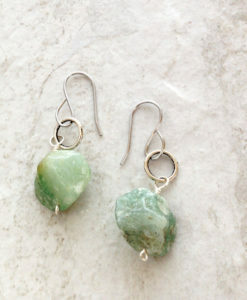 They may be opaque or transparent; their colors come from the use of various oxides. 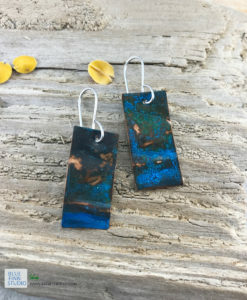 For my enameled copper jewelry I start with copper sheet that I draw and cut the shapes from. 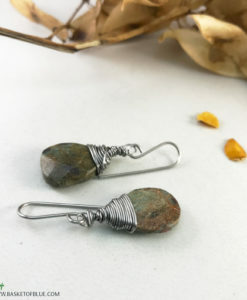 There are several stages of working with copper after this: shaping, filing, sanding, drilling cleaning. 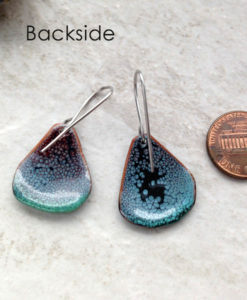 Enamels are applied to the base metal using a variety of techniques. 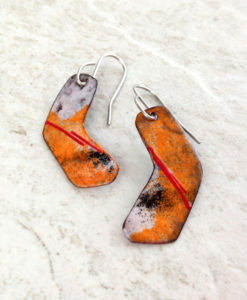 These may include dusting the enamel through a sifter; stencil; use of adhesives to bind the powdered glass; and other techniques. The pieces are then torch fired, either by holding with a steel rod or by using a trivet on a stand. Several layers of enamel need to be applied one at a time to produce a thick enough finish. Large pieces have to be fired one side at a time. This is where the real creativity happens! Enameling is characterized by brilliant, non-fading colors, tremendous durability, variety of color effects depending on angle of light, and tremendous versatility – from jewelry (many people are familiar with cloisonne, which is a type of enameling), to bowls and wall pieces, to large-scale interior or exterior murals. 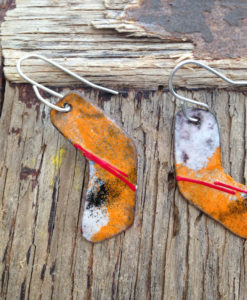 The medium of enameling goes back two thousand years and forms part of the artistic heritage on six continents. 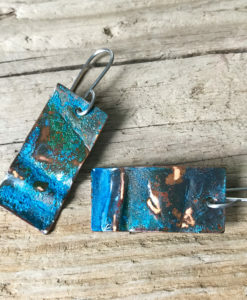 How to care for enameled copper: Enamel is glass, not paint, so it does not fade under ultraviolet light. 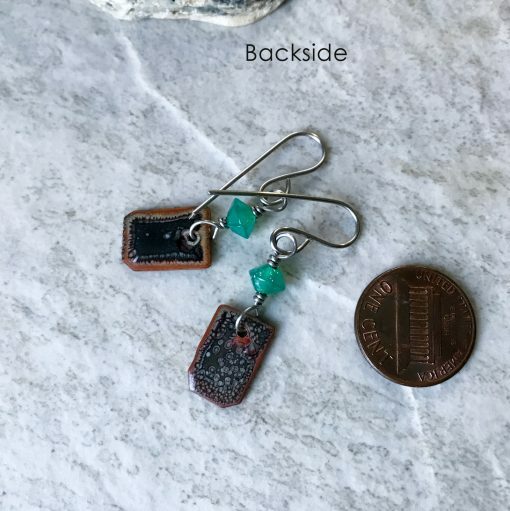 It is possible to crack or shatter when the substrate is stressed or bent, but modern enamels are relatively chip- and impact-resistant because of good thickness control and thermal expansions well-matched to the metal. 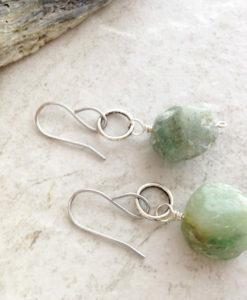 (Essentially, avoid dropping your jewelry on a concrete floor) There is no particular care needed, you can wash it with water and/or wipe it with a cloth if needed.